Welcome to the 25th edition of the Carnival of Divided Government- The special "Constitution Day Week" Edition. As explained in earlier editions, we have adopted Latin ordinal numeration to impart a patina of gravitas reflecting the historical importance of the series. In this, the Carnival of Divided Government Sextus et Vîcênsimus (XXVI), as in all of the CODGOV series, we select volunteers and draftees from the blogosphere and main stream media writing on the single topic of government divided between the major parties (leaving it to the reader to sort out volunteers from draftees). Consistent with this topic, the primary criteria for acceptance in the carnival is to explicitly use the words and/or concept of "divided government" in submitted posts. A criteria that, to our endless befuddlement, is ignored by many of the bloggers submitting posts, which sadly results in DWSUWF reluctantly ignoring their fine submissions. Yesterday was Constitution Day and kicked off Constitution Week - a holiday created four years ago to mandate that schools receiving federal funds focus on teaching the Constitution. My home town paper laments that “Constitution Day has become a holiday-lite, a calendar marking that brings up nods of appreciation but little else.” Perhaps that makes USA Today a better newspaper to take note of the holiday with a brief 100 word story (I scored 80% on the linked quiz). For five months in 1787, a constitutional convention convened in Philadelphia to revise the Articles of the Confederation. The articles were considered inadequate for the nascent federal government to deal with conflicts such as Shay’s Rebellion. Instead of revising the Articles, the delegates wrote an entirely new document. 221 years ago - on September 17, 1787 - 39 of the 55 delegates to the convention signed the Constitution of the United States. It is the oldest and shortest Constitution of any major government in the world, and the first to be written by representatives of those who were to be governed. Before becoming the basis of our government, the Constitution had to be ratified by the states. Having fought to escape the shackles of a distant despotic monarchy, many were understandably leery of a replacing it with a less distant but strong federal government. The document was debated by citizens and leaders in the mass media of the day - newspapers and pamphlets. It is hard to argue with that conclusion. 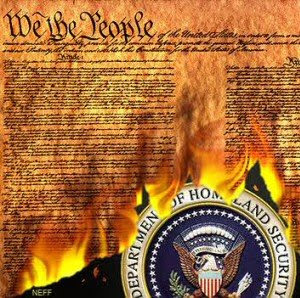 But until such time that additional protections for the governed can be built into the Constitution, we the governed can address this Constitutional defect on our own - by never voting one party into control of the Presidency, Senate, and House or Representatives. 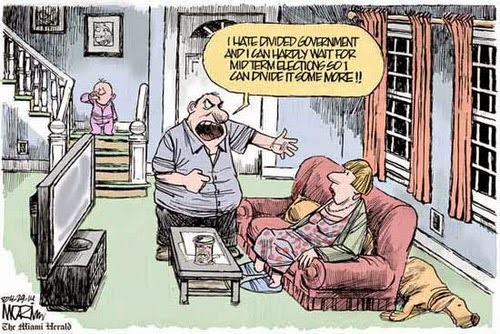 By voting for divided government. The Glittering Eye thinks this is good advice, as does Brad Delong. If the McCain campaign does not find David Brooks convincing, perhaps they will find another, more conservative pundit more compelling. "George Will thinks that John McCain's "closing argument" to elect him should be what a divided government would mean to the country. Seriously, that's the only selling point for McCain that Will could come up with. You can almost feel the enthusiasm." Will's sentiment is echoed by Scribbler at Scrivener.com in "What is the real difference between Obama and McCain..."
"When each party has a share of power in the government each blocks the other's worst, most partisan spending -- and when actually trying to get serious things done, bipartisanship is forced as the only way to do it... Fiscal restraint, thy name is "divided government". If that's your issue, that's what to vote for." Fiscal restraint is indeed my issue. Along with better governance, reinforcing the checks and balances in the constitution, oversight on the executive, fewer wars, more carefully considered legislation, and less corruption. 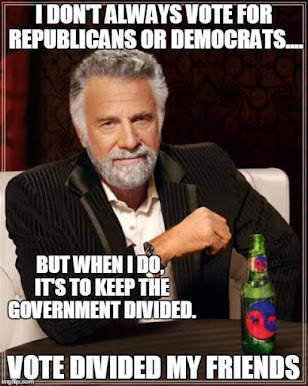 And for all those issues, I am voting for divided government. "The most important thing about a McCain presidency would be that he would be stymied at every turn by an almost certainly Democratic house and senate. Divided government governs best. He stands almost a zero chance of doing any of his expensive and misguided crap while he has to share power, and that is likely to keep his total expenditures lower than his ambitions. Obama would likely face a united Democratic government that would be free to make expensive and poor policy." This all seems so obvious and beyond contradiction that I find it astonishing that this perspective is not accepted as conventional wisdom. The reality is that even among those who are sympathetic and understand the argument, it is a small minority that are willing to act on this knowledge with their vote. OTOH, with polarized, divided and balanced electorate - a small block voting in concert for divided government can determine the outcome. "I have serious issues with McCain, especially on the issue of free speech and Campaign Finance "Reform", He wasn't my first or even second choice in the primaries, but I can deal with him, whereas I can't deal with Mr. Obama. This is especially true since the chance of either house going R is somewhere less than zero. Given that I don't trust any of the players, I find divided government rather appealing for now." "I am voting for McCain/Palin in November because the best result for this country will come from divided government. A McCain presidency IS MUCH MORE LIKELY to reach across the aisle than an Obama presidency where aisle-reaching is not required. What incentives will Obama have to govern in the center? (0, NULL, NADA, NYET). But McCain will HAVE to reach across the aisle to govern effectively." We'll conclude with Donald Luskin writing an Op/Ed at the Wall Street Journal and cross posted on his own blog with the catchy title "Divided Government is best for the market." "If the electorate were really smart, it would elect a Democratic president and a Republican Congress. Under that deal, stocks have averaged a 20.2% total return, and real GDP averaged 4%. That tells us that economic and stock market success isn't really about partisan politics at all. Sadly, nobody has a political incentive to conduct a study about that." I am not so sure about this argument. In any case, given the turmoil this week, I don't think this was the best time to make it. The market is a discounting mechanism. It is always looking to the future (if it is not caught up in a greed bubble or a panic crash). I may have some additional research to contribute on this subject, but lets give this all a week or two to settle down. Traditionally, we conclude this Carnival by including one "off-topic" submission, as a grudging acknowledgment and proxy for the many off-topic submissions received. Off-topic in this context meaning - no mentions of "divided government" or gridlock. For this edition, we selected Ron McKie presenting "God bless America" posted at Phuck Politics. Not our politics and not on topic. But I appreciate the sensibility and what the hell, he has an image of the constitution at the top of his blog. Sort of. And with that we conclude this edition. Thanks for stopping by, and thanks for all of the submissions (on-topic or not). As noted in a previous carnival, we saw a big spike in Divided Government posts and articles two years with two months to go before the election. We are seeing the same now. In response we are increasing our CODGOV posting frequency between now and the election. I'll continue try to get one of these out every week to ten days or so. The next edition will be the Carnival of Divided Government Septimus et Vîcênsimus (XXVII) - Special "Day of Mourning for the End of the Trout Season" Edition which will be somberly posted from the Upper Peninsula of Michigan branch of the DWSUWF Worldwide Operations, on or about the first day of October. Submit your blog article at carnival of divided government using our carnival submission form. Thanks for putting me into the carnival. I figured I would roll the dice since I had the constitution at the top and I talked about the government. Despite the fact that I disagree with 90% of your posts, your blog had me laughing out loud (I always spell it out when I actually do laugh out loud, instead of making some stupid point with the acronym - lol). I hope you write something about Divided Government now, so I can include you in the next carnival also.